Torrents of rain come to the Rio Grande Valley once or twice a year. After a few days, hordes of mosquitoes emerge. There’s no escaping except to run screaming into a building swatting at bare skin. Nighttime comes; bats awaken, unfold their wings and soar through fields, neighborhoods and cities devouring tons of insects, including millions of dreaded, possibly disease-carrying, mosquitoes — all night long. The next day, fewer mosquitoes are piercing delicate skin, sucking out your life-blood. Come morning, the bats are hidden from view, roosting in the brown “skirts” of palm trees dotted across the Valley’s iconic landscape. But wait — most of the Valley’s palms are denuded of all but a small cluster of green fronds. A palm skirt, or beard, which hangs from untrimmed palms, is the preferred roosting place for bats. From Corpus Christi to the Mexican border, it’s tradition to trim palm trees once or twice a year, leaving only about five fronds sticking straight up. Trailer-loads of palm fronds are removed annually from trees in public parks and rights of way as well as residential yards. Why? Because it’s been done that way as far back as living memory, and because people think this looks tidy. Unfortunately, this tradition adds to the number one threat to bats: loss of habitat. Bats especially suffer from the loss of palm tree skirts. Those dead-looking palm branches house legions of bats. Because bats are night-fliers most people are unaware of the healthy bat population we have in the Valley and the benefits of bats to our daily lives. In moderate climates like the Valley, bats roost in trees. In areas with few trees, many cavity-roosting bats roost in manmade structures like buildings and bridges. Texas has the highest population of bats in the United States. It is home to the largest colony of bats in the world. On summer nights, hundreds of people gather to see the world’s largest urban bat colony — some 1.5 million bats — emerge from under the Congress Avenue Bridge in downtown Austin. They are Mexican free-tailed bats that migrate each spring from central Mexico to various roosting sites throughout the southwestern U.S. They reportedly eat upwards of 10,000 pounds of insects — including agricultural pests — each night. Closer to home, the South Texas Border Chapter of Texas Master Naturalist offers occasional bat-watching field trips to the Conway Street exit on Expressway 83. They meet in a parking lot across from the overpass on the north side of the intersection. At dusk, they are rewarded with a similar experience to the bat watch in Austin, with bats emerging from the expressway bridge. Most of the bats observed during the recent Mission field trip were the insectivorous Mexican Free-Tailed bats along with Northern Yellow, Silver-Haired and Hoary bats. Insect-eating bats consume three quarters of their body weight each night in insects. In addition, bats are major pollinators of more than 300 species of fruit. In the Valley, bats help pollinate fruits, such as bananas, avocados and agave. They help pollinate night-blooming cereus, moonflowers and other plants whose blooms open at night and require pollination to produce fruit and seeds, ultimately feeding other native critters and birds. Mexican free-tailed bats breed August through October — but not without a place to roost, such as the skirts of palm trees or crevices in bridges. It’s so easy to offer bat roosting sites because it basically starts with doing nothing — that is, doing nothing to the palm trees as they cycle through their natural evolution of new growth to the eventual sloughing of dead palm fronds to the ground. Be kind to the Valley bats and to your palms trees by keeping the palm frond skirt around their trunks — and house a few hundred bats through the summer and fall. You’ll be doing yourself and your neighbors a tremendous amount of good. Bat Week is Oct. 24-31. Nature centers will be offering workshops, presentations and educational materials to help promote bat awareness. Useful websites that offer information about bats include http://batweek.org/education-event/ and www.batcon.org. A Wildlife Habitat Council site offers a bat webinar at www.wildlifehc.org. 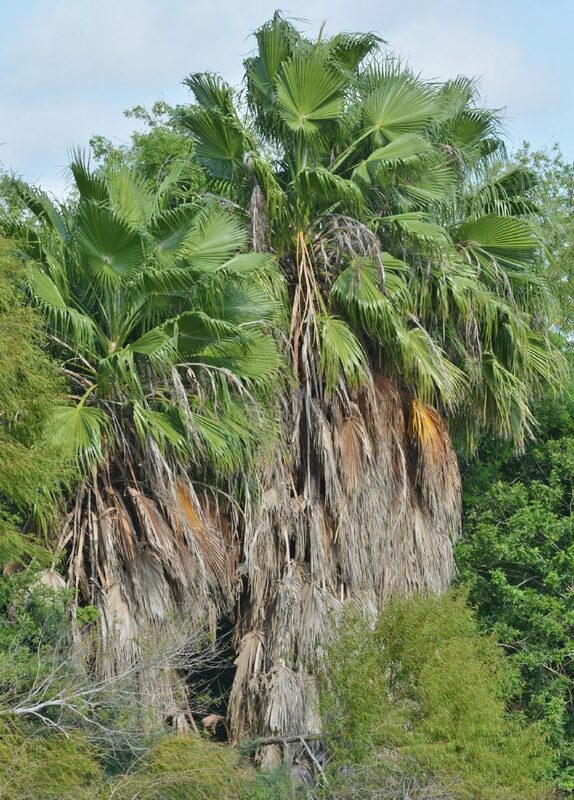 >> When live, green fronds are cut off a palm, photosynthesis is reduced and the palm can become stressed. In hard times, like drought, freezing weather or disease pandemics, improperly pruned palms are at risk of an untimely death. >> The skirt protects the palm’s trunk from sun damage, drying wind, freezing and insect attack. >> Palm tree bark provides protection to the palm. Tree spurs, often worn by palm trimmers, pierce the bark allowing infectious diseases and insects to attack the tree. >> If you must prune your palms, hire a reputable tree trimmer who is licensed, bonded and insured, and who will use only a ladder or cherry picker and not tree spurs. >> Sterilize, disinfect and clean all pruning tools with alcohol. >> Prune moderately in early spring, never in the heat of summer or prior to winter freeze. >> Leave about six inches of the fronds “boot” in place to protect the trunk.